Digital Excellence is the Key Ingredient to Next Gen Channel Success. The single biggest goal for a digital first channel organization should be commitment to digital excellence. The most valuable brands in the world today are excelling in this regard. Channel focused organizations who understand this imperative will have a major marketplace advantage. 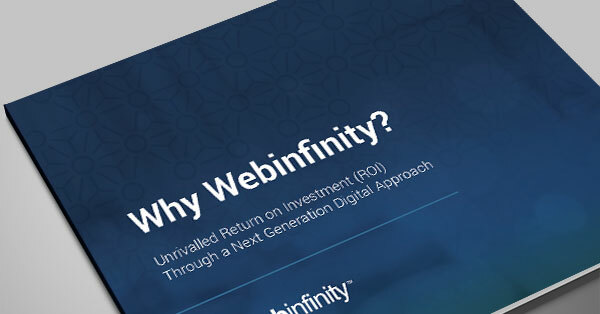 Webinfinity provides an unrivalled quality of experience via a single SaaS UX that is constantly evolving based on continuous upgrades from a dedicated team. Top Line ROI - A digital first approach that will transform revenue generating interaction across your entire channel ecosystem. Bottom Line ROI - A delivery and support model which is commercially and technically efficient and flawless at scale. Measurable ROI - Immediate/actionable digital insights that will directly correlate user behavior with channel revenue. Long Term ROI - An architectural vision that is future proofed for long term success and scale.